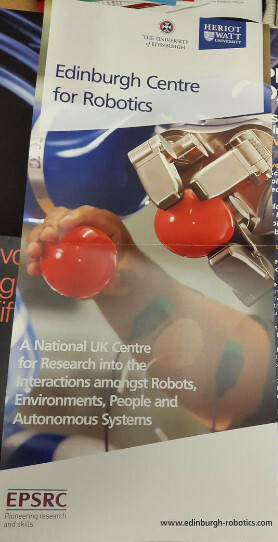 The Edinburgh Robotics Centre is a joint activity between the University of Edinburgh Schools of Informatics and Engineering and Heriot-Watt University’s Engineering and Physical Sciences, Mathematical and Computer Sciences Department. My research interest is in Human and Robotic Agent Collaboration in a Helpful Environment for Medical Care, Assistive Living and Flexible Product Assembly. This brings together a number of threads in our own work on task achieving agents, artificial intelligence planning, collaborative systems, the “Helpful Environment” and intelligent interaction spaces (“I-Rooms”). A number of application scenarios require a combination of human and robot agents and environmental sensors to properly provide support in a number of important economic and social areas, such as medical care, assistive living and flexible product assembly. The Planning and Activity Management Group within the Artificial Intelligence Applications Institute (AIAI) in the School of Informatics at the University of Edinburgh is exploring representations and reasoning mechanisms for inter-agent activity support. The agents may be people or computer systems working in a coordinated fashion. The group explores and develops generic approaches by engaging in specific applied studies. Applications include crisis action planning, command and control, space systems, manufacturing, logistics, construction, procedural assistance, help desks, emergency response, etc. Our long term aim is the creation and use of task-centric virtual organisations involving people, government and non-governmental organisations, automated systems, grid and web services working alongside intelligent robotic, vehicle, building and environmental systems to respond to very dynamic events on scales from local to global. While our work on O-Plan and I-Plan and the release of these planners for open access has led to them being very widely applied in a broad range of areas, they are complex systems that are difficult to reuse where the planner is intended only as a component of a much more extensive multi-agent framework. However, their core concepts and the underlying plan representation provide a robust basis for reasoning about and generating plans. Of specific relevance to the proposed project is our work on a powerful and flexible representation of plans called <I-N-C-A> (Issues, Nodes, Constraints and Annotations) which represents plans as a set of constraints on a space of options for activity. <I-N-C-A> is a target for knowledge representation, reasoning and analysis of plans, objectives, activities, descriptions of past activity, agent capabilities, etc. It is a representation that has also been utilised in standards work such as in the NIST/ISO Process Specification Language. 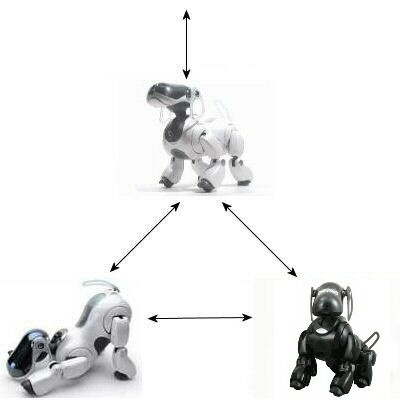 Project AIBO explored Artificial Intelligence technology to support team work between human and robotic systems working in a cooperative and safety conscious way in the home or the workplace. The project aimed to be an source of interesting and relevant student projects in Artificial Intelligence, Robotics and Informatics at the University of Edinburgh. It also was used to give interesting exhibits for open days, school visits and to entertain visitors. This entry was posted in Edinburgh, Robots and tagged Edinburgh, Robot. Bookmark the permalink.